Hinkle Field House at Butler University, scene of hoop miracles. 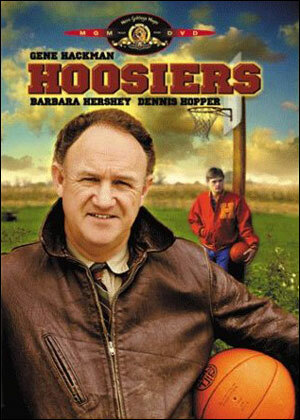 There’s a scene in the movie classic “Hoosiers” where Coach Norman Dale, played by Gene Hackman, gives a short locker room speech before his Hickory High School team plays for the Indiana state championship. Well sometimes dreams do become reality, and Hollywood tales come true. Like Hickory High, Butler University, which punched a ticket to the Final Four with a win over Kansas State, is representing all the small schools across America who’ve ever dreamed of going to the Final Four. Butler is a David among the Goliaths. A member of the mid-major Horizon League, is 32-4 and hasn’t lost a game since December. The fifth-seeded Bulldogs have won 24 games in a row. Although 11th-seed George Mason did make the Final Four in 2006, you really need to go back to 1966 to find the last time a small school won the NCAAs. That was Texas Western, now UTEP, which surprised top-ranked Kentucky. Loyola of Chicago was an upset winner in 1963. The Ramblers, now members of the Horizon League, stopped two-time champion Cincinnati. Holy Cross in 1947 and CCNY in 1950 were other surprise winners in a tournament generally dominated by the bigger-name schools, like UCLA, Kentucky, Indiana, North Carolina and Duke. Proving that fact can be stranger than fiction, the final game in “Hoosiers” — where undermanned Hickory beats a heavily favored team from South Bend Central on a last-second jumper by star Jimmy Chitwood — is filmed in Butler’s Hinkle Fieldhouse, called the Butler Fieldhouse in the 50s. Butler played its first basketball game in the Fieldhouse in 1928, defeating Notre Dame 21-13 in overtime. The name of the facility was changed in 1966 from Butler Fieldhouse to Hinkle Fieldhouse in honor of Butler’s legendary coach and athletic director, Paul D. “Tony” Hinkle. The Fieldhouse has served as host to four U.S. presidents (Herbert Hoover, Dwight Eisenhower, Richard Nixon and Gerald Ford), the Billy Graham Crusade, the Sonja Henie Ice Show, four professional basketball team, even a three-ring circus and a six-day bicycle race. When the Fieldhouse was originally constructed, it was the largest basketball arena in the United States, and it retained that distinction for more than 20 years. 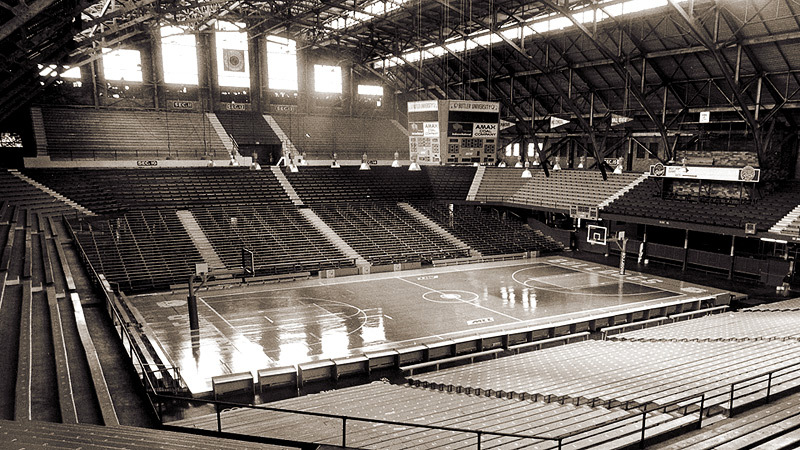 Recent renovation has reduced the seating capacity from 15,000 to around 10,000, but the aura that made Hinkle Fieldhouse one of the nation’s first great basketball arenas remains today. Fittingly, the Final Four next weekend will be held in Indianapolis, at Lucas Oil Stadium, just seven miles from the Butler campus. Does Butler have a Bobby Plump or Jimmy Chitwood moment waiting? Well, Dorothy, Kansas isn’t in the NCAA tournament any more either after being kayoed by Northern Iowa in a Cinderellian effort. The top-seeded Jayhawks were knocked out by ninth-seeded NIU in one of the bigger surprises in NCAA history. The Panthers became the first team to beat a No. 1 seed in the second round since UAB and Alabama did it to Kentucky and Stanford, respectively, in 2004. 1944: Utah 42, Dartmouth 40 (OT) — Utah originally turned down an invitation to the NCAA tournament, but was given a second chance after losing in the NIT, and after Arkansas pulled out of the tourney after two players were injured in an automobile accident. In those days there were no seedings and no 64-team field, just two, four-team regionals and a title game at New York’s Madison Square Garden. The Utes, shown left, were the youngest NCAA champion in history; the team’s average age was 18 years, six months. And in the midst of World War II, the team had two Japanese-American players, one on release from an internment camp. The Utes defeated Eastern champion and heavily favored Dartmouth in the championship game on a set shot by forward Herb Wilkinson in the first overtime championship game in NCAA history. Utah became known as the Whiz Kids, Zoot Utes, and the Live Five from the Jive Drive. 1956: Canisius 79, North Carolina State 78 (4OT) — The Wolfpack was ranked second in the nation when they faced Canisius in the first round. The Golden Griffins won in four overtimes. The two teams set a record for longest NCAA Tournament game that’s been once tied (1961), but never broken. The San Francisco Dons, led by Bill Russell, won the NCAA title that year. 1966: Texas Western 72, Kentucky 65 — Texas Western (now the University of Texas at El Paso) and its all-black starting five was a heavy underdog to Kentucky’s all white starting five, including Pat Riley, and openly racist coach, Adolph Rupp. Yet the Miners managed the win. Rupp “carried the memory of that game to his grave,” wrote his biographer, Russell Rice. 1979: Penn 72, North Carolina 71 — The Quakers beat top-rated UNC in the East Regionals and later St. John’s in the Eastern regional finals, and became what remains the last Ivy League team to make the Final Four. Penn would be the only team to beat four higher seeded opponents to reach the Final Four until the feat was matched in 1986 by LSU and again in 2006 by George Mason. Penn was crushed in the national semis by Magic Johnson and Michigan State, which went on to beat Larry Bird’s Indiana State team for the championship. 1985: Villanova 66, Georgetown 64 — Many thought the eighth-seeded Wildcats didn’t belong on the same court with Patrick Ewing and the defending champion Hoyas. Georgetown had already beaten Villanova twice during the regular season. But the Wildcats shot a record 78.6 percent from the field, missed only one shot in the entire second half, and became the lowest-seeded team ever to win the national championship. 1991: Richmond 73, Syracuse 69 — Richmond became the first No. 15 to beat a two seed (16 seeds have never beaten a one seed in 104 tries in the tournament.) The win inspired the immortal headline: Orangemen Bitten by Spiders. Other 15-2 shockers include Santa Clara over Arizona in 1991 and Coppin State over South Carolina in 1997. 1998: Valparaiso 70, Mississippi 69 — One of the most famous last-second shots in basketball history and the poster child for buzzer beaters was the three pointer by Bryce Drew, left, that helped 13-seed Valparaiso beat Ole Miss in a stunner. 2006: George Mason 86, Connecticut (OT) — A suburban commuter school from Fairfax, Va., that was a dicey choice to make the NCAA tournament as an at-large team, the 11th seeded Patriots upset No. 1 seed UConn and reached the Final Four. The Patriots were only the second double-digit seed to make the Final Four, matching LSU’s run, also as an 11th seed, in 1986. They were the first true outsider to crash the quartet since Penn and Indiana State both got there in 1979. 2010: Northern Ohio 67, Kansas 65 — It’s rare that the top seeded team in the tournament goes out this early. But NIU guard Ali Farokhmanes, the answer to future trivia question, hit a three-pointer with 34 seconds left to ultimately doom Kansas. Yes Dorothy, lions and tigers and bears….and Panthers too. There’s an old cliche that goes something like this — if it ain’t broke, don’t fix it. The decision-makers in the NCAA should take that saying to heart. Cliches are cliches for a reason — because they work. Just like the NCAA basketball tournament. Yet the NCAA is reportedly exploring the possibility of expanding from the present field of 64 to 96 teams next year. That makes sense. Yeah right. Take something that’s created an aura and built a mystique around March Madness and change it. Why not eliminate Mother’s Day while we’re at it. “I don’t like it,” Washington coach Lorenzo Romar said of the 96-team potential. “I’m not going to tell you I’m going to get out of coaching because of it. But I’m more of a traditionalist. Yes, the mystique would go away, along with the NIT, which despite a long heritage of its own is dead if the NCAA goes through with this plan. With 96 teams, we’d be left with a tournament with a bunch of byes and 32 extra teams, mainly the leftovers and second-division finishers from the major conferences. The NCAA should spend less time worrying about March Madness and more into expanding the utterly laughable BCS football format. Or else, we’ll be left with a 96-team basketball tournament and a two-team football playoff next year. Do the math, it doesn’t add up. 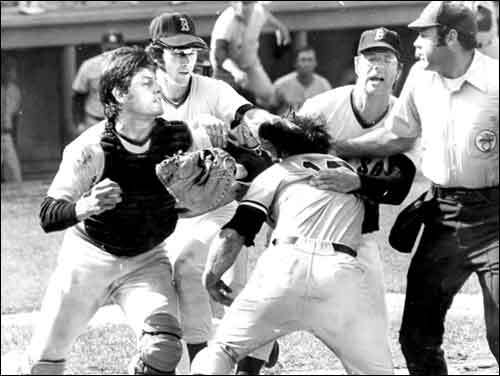 Carlton Fisk, left, and Red Sox mates mix it up with Yankees Thurman Munson. August 1, 1973, dawned hot and sunny, and the events that took place later that day sparked a long dormant rivalry, much like the shots at Lexington and Concord ignited the Revolutionary War in April of 1775. But we’re getting ahead of ourselves. The Yankees-Red Sox rivalry wasn’t always as scrutinized, as popular and as intense as we know it today. For most of the past hundred plus years, it was hardly a rivalry at all — at least beyond the New York vs. Boston thing. With a few exceptions over the course of nearly four decades, whenever one team was up the other was down. The Yankees (then known as the Highlanders) and the Red Sox (then known as the Americans or Pilgrims) staged a close pennant race in 1904, one that wasn’t decided until last day of the season when New York pitcher Jack Chesbro, trying for his 42nd win of the year, threw a wild pitch to give Boston the American League pennant. But those showdowns were the exception rather than the rule. The Red Sox dominated the first 20 years of baseball, winning five World Series, before foolishly peddling Babe Ruth to the Yankees prior to the 1920 season. Then the Yankees took over, winning 29 pennants and 20 World Series between 1921 and 1964, the greatest dynasty in the history of sports. The Yanks went into a fast decline following the 1964 World Series; meanwhile the Red Sox surged to the front in 1967 with their Impossible Dream pennant run. Finally, in the early 70s, the Yankees and the Sox found themselves on the same plane, building towards playoff berths in a revamped MLB format. It all shook loose on an August afternoon in 1973. And a bunch of recently graduated hippies, aka the Bats, the name of their softball team, were at Fenway Park to witness it. That summer, the long hairs were living in a communal type setting in a house in the suburbs of Worcester, Mass. Many of them worked nights in the composing room at the Worcester Telegram, proofreading, running the soon-to-be extinct linotype machines, and occasionally suggesting headlines for the Telegram sports staff. On the Fourth of July in 1973, a bunch of the Bats visited the old, original Yankee Stadium to see the Yankees and the Red Sox battle for first place in the American League East. The Sox rallied with two runs in the ninth inning to win the first game 2-1, then took the nightcap 1-0. 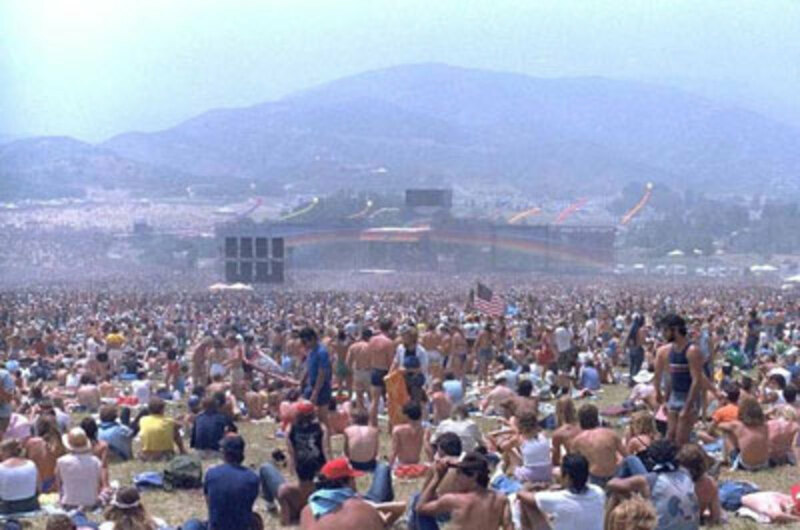 A month later, in early August — days after Summer Jam, the famed rock concert in Watkins Glen, N.Y., shown above, that drew 600,000 people — the Yanks invaded Fenway for a four-game series with first place on the line. And the Bats went into Fenway en masse for the third game of that series, an afternoon contest. It turned out to be the game that rekindled the greatest rivalry in sports and carried it to a fever pitch . And it began with a collision of catchers and team leaders, Thurman Munson of the Yankees and Carlton Fisk of the Red Sox. With the game tied 2-2 in the top of the ninth, Munson led off with a double and was sacrificed to third. With Gene Michael at the plate the Yankees attempted a suicide squeeze. Michael missed the pitch and Munson, a dead duck at home, tried to dislodge Fisk from the ball, only to have Fisk flip Munson aside. That set off a bench-clearing brawl, a glimpse into the battles that would come in the years ahead. The Red Sox went on to win that game 3-2, but more importantly the Yankee-Red Sox rivalry blossomed. The teams battled throughout the 70s, Boston winning the pennant in 1975, and the Yanks taking the flag in 1976, 1977 and again in 1978, when Bucky Dent’s home run sank the Sox. In the years since they have had many memorable showdowns, especially the back-to-back seven-game series for the ALCS in 2003 and 2004. Aaron Boone’s home run won the 2003 pennant for the Yankees, while the Red Sox overcame a 3-0 deficit to shock the Yankees the following year in the greatest playoff comeback in baseball history. And of course there were more than a few brawls mixed in over the years. Prepare to hear more about the rivalry leading up to Easter Sunday, when the Red Sox entertain the Yankees in baseball’s season opener at Fenway. If Old Ballparks Could Talk…. And last they did — in fact 10 of them lasted 50 years or more. And two — Fenway Park and Wrigley Field — stand to this day. All 16 major league teams at the time called these parks home at one point or another. Shibe Park in Philadelphia, Sportsman’s Park in St. Louis and the Polo Grounds in New York housed both National League and American League clubs at the same time. Shibe Park, Philadelphia, 1909 — On Opening Day in the new Philly digs, A’s veteran catcher Michael “Doc” Powers, who was also a medical doctor, crashed into the wall behind the plate w hile trying to catch a foul pop. Powers suffers a severe intestinal injury and left the game in the seventh inning. Despite three operations, Powers passed away two weeks later. Sportsman’s Park, St. Louis, 1909 — St. Louis Browns owner Bill Veeck pulled off his most famous stunt in 1951. 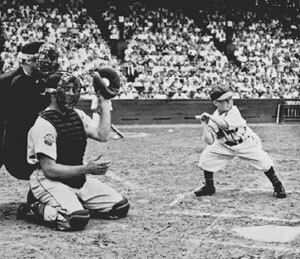 After jumping out of a cake between games of a doubleheader, 3-foot, 7-inch midget Eddie Gaedel, shown left, wearing number 1/8, stepped up to the plate and walked on four pitches from Detroit’s Bob Cain. Gaedel was pinch-run for, and never appeared in another major league game. Forbes Field, Pittsburgh, 1909 — Late in the 1920 season, the Pittsburgh Pirates and Cincinnati Reds staged the last tripleheader ever played in the majors. After dropping the first two games by scores of 13-4 and 7-3, the Pirates salvaged game three 6-0. But by then the Reds had already secured third-place money. League Park, Cleveland, 1910 — The Indians, on the way to their first championship, routed the Brooklyn Dodgers 8-1 in Game 5 of the 1920 World Series.. But the game will be remembered for three World Series firsts by Indians players — Elmer Smith’s grand slam, pitcher Jim Bagby’s home run, and shortstop Bill Wambsganss unassisted triple play. Comiskey Park, Chicago, 1910 — Bill Veeck’s son Mike was the mastermind of Disco Demolition Night in 1979 — a promotion that backfired. Fans were encouraged to bring disco records to be burned on the field between games of a doubleheader with the Tigers. Mayhem ensued, thousands of fans poured onto the field and refused to budge, and the umpires forfeited the second game to Detroit. Griffith Stadium, Washington, 1911 — The new Senators ballpark, right, built in just a month following a fire that destroyed the wooden grandstands, featured some odd dimensions, such as 407 feet down the left-field line. But the strangest quirk was the indent in center, with a portion of the wall jutting inward to accommodate a tree and several houses whose owners were unwilling to sell. Polo Grounds, New York, 1911 — In a park made famous by Bobby Thomson’s home run and Willie Mays’ catch, the strangest event at the Polo Grounds was the death of Indians shortstop Ray Chapman in 1920 .Chapman was beaned by Yankees submariner Carl Mays and died the next day, the last death on a major league ballfield. Crosley Field, Cincinnati, 1912 — President Franklin D. Roosevelt flipped a light switch at the White House and the Reds beat the Phillies 2-1 in the first night game in major league history in 1935. Crosley Field also was the first park to place distances on the outfield fences “so the spectators may readily ascertain far drives carry” according to the Sporting News. Fenway Park, Boston, 1912 — The Red Sox abandoned Fenway Park, left, during the 1915 and 1916 World Series to play their home games at Braves Field. In 1929 they announced they were considering vacating Fenway. Between 1929 and 1932 the Sox played their Sunday games at Braves Field due to Fenway’s proximity to a church. Tiger Stadium, Detroit, 1912 — Tiger Stadium opened on April 20, 1912, the same day as Fenway Park and less than a week after the Titanic hit an iceberg and went down in the North Atlantic. The new ballpark was known as Navin Field at the start, and was built on the same site where the Western League Tigers played in 1886. Ebbets Field, Brooklyn, 1913 — In one of Brooklyn’s daffiest moments, the Dodgers wound up with three men on third base — Dazzy Vance, Chick Fewster and Babe Herman. Herman, who will long be remembered for doubling into a double play, was called out for passing a runner, and Fewster wandered off the bag and is tagged out. For years Brooklyn fans would respond “Which base?” when told the Dodgers had three men on base. Wrigley Field, Chicago, 1914 — Surprisingly, the Cubs were not the first team to call Wrigley Field home. The Chicago Whales played at the new Weeghman Park in 1914 and 1915 before the ill-fated Federal League disbanded. The Cubs moved in for the 1916 season, and the park was renamed Cubs Park; 10 years later it became Wrigley Field, right. Braves Field, Boston, 1915 — Built on what was once a golf course, Braves Field was a long par 5 — 400 feet to left and 440 to center, with a gaping 500-foot chasm in right center. Needless to say, it was not exactly a homer haven. Only eight home runs were hit in the first year of the park, and none of them went over the fence.